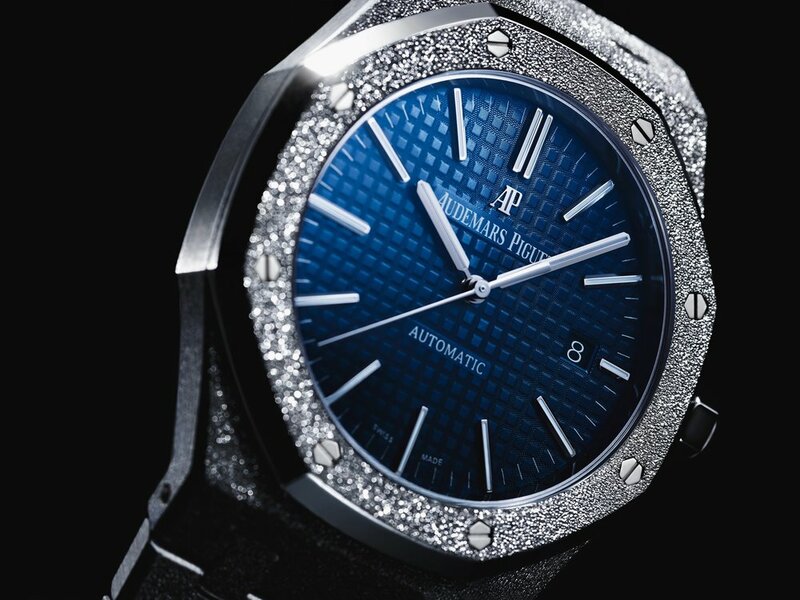 Following the success of the Royal Oak Frosted Gold launched in November 2016, Audemars Piguet now unveils the new Royal Oak Frosted Gold Limited Edition 41mm of 200 pieces, boasting the following features: 18-carat white gold case and bracelet, glareproofed sapphire crystal caseback, blue toned “Grande Tapisserie” dial and Royal Oak hands with luminescent coating. Meticulously crafted, effortlessly worn, the Florentine finish adorning the Royal Oak Frosted Gold is a textured surface decoration on precious metal invented decades ago, predominantly on smaller jewellery pieces. By beating the gold with a diamond tipped tool, it created tiny indentations on the surface that gave a sparkle effect similar to that of precious stones, like diamond dust. The challenge for Audemars Piguet’s craftsmen was to apply this surface treatment technique across the case and bracelet of the watch without altering the clean lines that define the Royal Oak’s form. Then the original gradating bracelet construction also demanded that the order in which the rest of the finishing (polishing and satin finish) is executed be reconsidered. It is a very delicate alchemy to operate: nothing is added, nothing is removed, but the watch is transformed.